In need of last minute weekend plans? Well have I got something in mind for you! 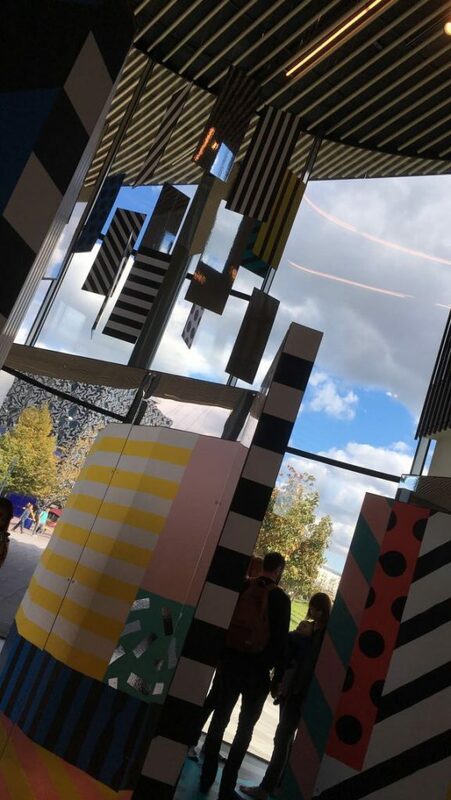 Only open until this Sunday, is artist Camille Walala’s: ‘WALALA X PLAY’ – an innovative and immersive artwork installation exclusive to NOW Gallery at the O2’s Greenwich Peninsula. My friend and I visited Walala’s artwork installation today and we were not disappointed. The said installation is a maze which explores pattern, colour, shape and movement in relation to the human scale and form. Visitors are required to weave their way through the puzzle-like structure of the maze, the walls of which are constantly running alive with print and colour and which morph into different shapes and angles. The fact visitors are asked to remove their shoes before entering, really adds to Walala’s aim of forcing people to engage with their own bodies and with issues of sensitivity and physicality. In particular, the removing of shoes reminded me of when I visited soft play areas as a child, which all adds to the element of fun and play at the heart of the installation. 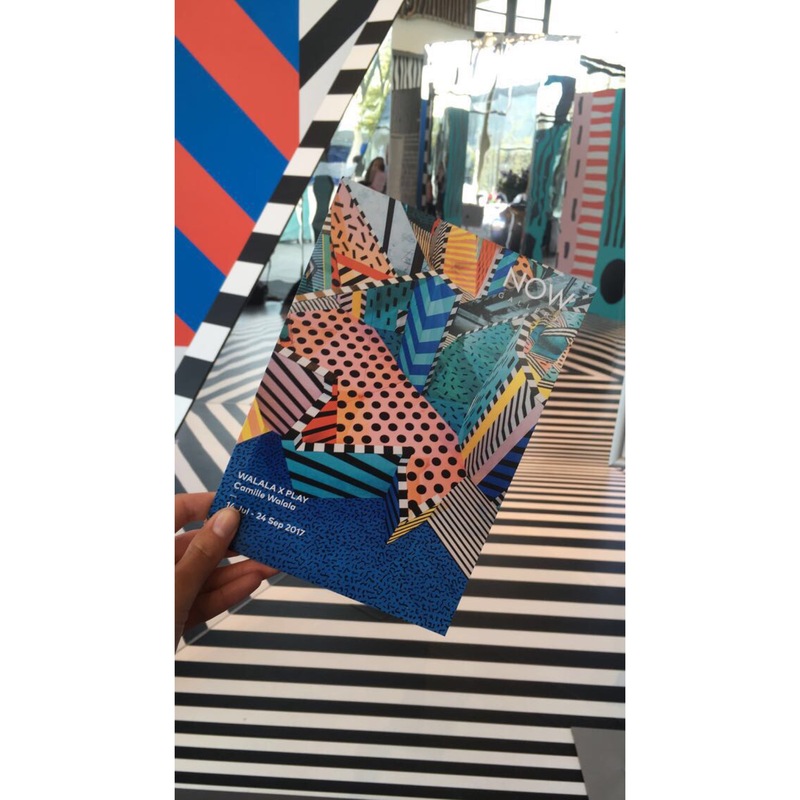 For Walala further invites the public to play a game of ‘spot the difference’, by noticing the inconsistencies and differences in the patterns embedded in the walls of her installation. Not only do certain patterns and colours disappear upon entering into a new part of the maze, but secret spots can be discovered the further in you delve. Visitors must look closely at the patterns, surveying them from all angles so as to complete the puzzle. Although the artwork installation itself is small in scale and duration (taking no longer than 15 minutes to view) the effort required to interact with the installation is far greater. The difficulty of the maze is increased by the fact the layout is not just restricted to the floor- shards of patterned shapes are also suspended above visitors’ heads on the ceiling. Visitors must also deal with seeing multiple versions of themselves as their bodies become reflected, refracted and distorted by the mirrors woven into the walls of the maze! The unique tribal-like style of Walala’s patterns are derived from several influences, such as: the Memphis Movement, the Ndebele tribe and op-art artist Victor Vasarely. Moreover, the layout of the installation is further influenced by the likes of the waterways of the Greenwich Peninsula and the twists and turns of the Thames’ current. However even if you do not have a particular interest in art, I must stress that this installation is something fun, quirky and interactive. It is ideal to go alone, with friends and family, or to just get those insta-worthy pictures. Oh and how did I nearly forget to mention that it is free? Yes you did hear me right, it is FREE, thus catering perfectly for the majority of CUB’s readers who are students. Booking is required beforehand online at: http://nowgallery.co.uk/exhibitions/walala-x-play/ so I would recommend you find a time that is convenient to you so as to avoid disappointment.